Christian Burgess training with his new club today. Posh defender Christian Burgess has today (June 25) completed his move to Portsmouth. The 23 year-old centre-back has joined the Sky Bet League Two side for an undisclosed fee. Burgess has penned a three year deal at Fratton Park and becomes Paul Cook’s sixth summer signing since taking over the reins at Pompey. Burgess is becomes the first of the unwanted seven Posh players to leave the ABAX Stadium. The clubs agreed a fee believed to be in the region of £75,000, similar to the amount Posh are understood to have paid Middlesbrough for his services last August. His departure after just 33 appearances and four goals brings to an end a topsy-turvy 10 months at Posh. Former Posh boss Darren Ferguson signed Burgess, but his departure in February spelt the end for a player whose ability on the ball failed to make up for his lack of defensive qualities. His tackling, heading and positional play were all called into question. Current Posh boss Dave Robertson started with Burgess in his side just once, the 1-0 home defeat by Coventry at the end of March. The fact that Robertson preferred a raw, untested - and at the time - error-prone central defender like Ricardo Santos meant the writing was on the wall for Burgess who nonetheless will join a club that should be challenging for honours next season. It’s thought that rumours suggesting Posh winger Joe Newell will be following Burgess to the south coast are false. 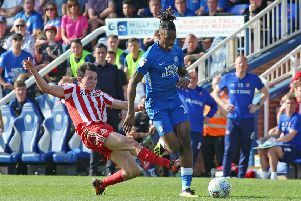 There has been very little interest in any of the other transfer-listed players apart from centre-back Shaun Brisley who has been the subject of seven enquiries, none of which have satisfied the player or Posh. Other Posh players available for transfer are midfielder Kane Ferdinand, strikers Kyle Vassell and Luke James as well as last season’s captain Jack Payne. James is understood to be keen on a return to his native north-east. Brisley also wants to return to the north, while Payne is thought to prefer a move to a southern-based club.